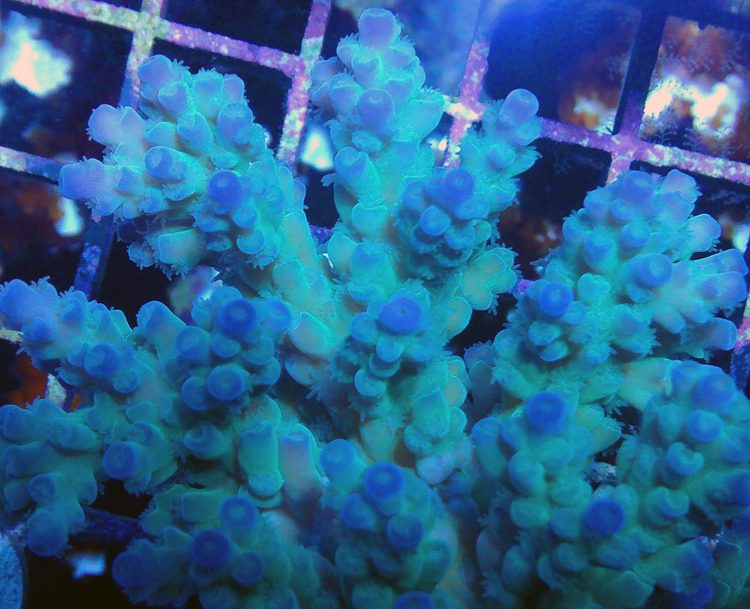 The Gonzo’s Day Tripper Acropora has a very striking appearance due to its bright two color pigmentation. Axial corallites and radial corlalite edges are colored bright blue. This blue can occur just along the edge, can cover almost the entire corallite wall or in the case of axial polyps can cover the entire corallite. Branch stems, lower corallites and also polyps are all colored bright fluorescent turquoise green. Josh at Gonzo Coral Frags acquired this Acropora as an imported colony from Indonesia during July of 2014. Josh recommends moderate to strong light intensity. Reeffarmers recommends moderate water current. Reeffarmers is maintaining a seed section of this coral in a 8 foot Raceway Gyre BiZonal system. This system is naturally filtered with a semi-cryptic zone and a reef flat exposed zone. In this captive reef the coral is positioned to receive moderate to strong light and water current. The first edition fragment of this coral is being sold on our Buy It Now web page. Introductory list price on November 12th 2014 is $70 for a small fragment.